To regain possession of your rental property, eviction is the only legally acknowledged procedure to be followed. A landlord has to understand that every state has its own specific set of rules for tenant eviction. Any failure in abiding by these rules on the landlord’s part can mean legal trouble with their case being thrown out of court and the entire eviction process having to be restarted afresh. This is why landlords need to fully understand the process of eviction and the mistakes to avoid so that a quick and hassle-free eviction process can be ensured. Here’s is a brief overview of the common mistakes that landlords need to avoid while evicting their tenant. Self-help or self-directed eviction refers to adopting illegal methods for evicting tenants instead of going through legal means for evacuating the rental unit. These methods include forcing the tenants to move out by making living conditions miserable for or intimidating/coercing them. Anything that would compel the tenants to vacate the property and is not legally recognized is not ideal if you want a trouble-free eviction. It is worth noting that forcing your tenant out of the property is a crime. If somehow you have successfully evacuated your rental unit and forced your tenants to move out, the tenants will have the right to pursue legal action against you. There might be more than one reason for using illegal ways to remove tenants such as tenant’s failure in paying your rent on time or breaching the lease but still, landlords have to adhere to certain rules and regulations under the law. Since both the tenant and landlord are bonded with a legally recognized lease agreement for a specific time period therefore, both are required to abide by the law and adopt legal processes for tenant eviction. Self-help eviction is not only illegal but dangerous as well because if you use any of the abovementioned methods to force your tenants to move out, there is bound to be a conflict, which may get violent at any time. Your tenants might feel betrayed or belittled and take matter to a whole new, violent level. There have been reports of violence between both parties where the conflict resulted in death of either the tenant or the landlord. Therefore, you must never risk your life and follow the law. You can get the court to issue order in case you want your tenant to be removed from the unit. Court will ask a trained sheriff to lock the property and take the tenant out. Before filing for an eviction you need to send the tenant a Notice to Quit, which basically informs your tenant that you will be initiating eviction process for the reason that has already been mentioned on the Notice. Usually, the Notice if filed when the existing tenant fails to pay the rent and breaches the lease agreement. It is also possible that landlord present tenant a Notice to Quit without any fault of the tenant but for another reason such as property being sold or taken off the rental market for some time. Whatever be the reason, after being presented the notice, the tenants will have to leave the property. Do remember that you need to follow the law of your state regarding the timeline of issuance of this Notice. Some states require the notice to be presented at least three days in advance and some may require over a year. That is, the reason for eviction will dictate the timing of presenting the Notice to Quit. Ignoring the issuance of Notice to Quit or not presenting it to the tenants far enough in advance means you would have a difficult time in evicting the tenant and the entire eviction process will be started all over again. 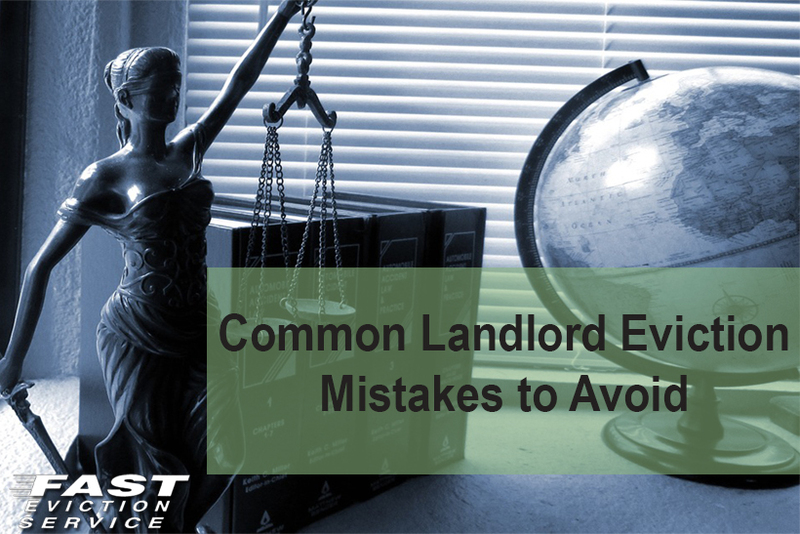 It is an extremely common mistake that almost all landlords make while pursuing eviction of their tenants. Although landlords can make claims about the tenants’ failure to fulfill the terms of the lease agreement but a majority of times they cannot support the claims with appropriate, authentic evidence. For instance, if the reason for eviction is non-payment of rent then landlords is required to provide the court bank statements because it will have to be proved that tenant has not paid the rent. By merely claiming it would make your case weak as there will be doubt about the claim. Similarly, if you want to evict the tenant due to damages caused to the rental unit, it is important to bring along pictures, videos or any other proof that would serve as evidence of your claim. Any evidence to support your Motion to Evict such as complaints lodged against the tenants by neighbors or other tenants is also helpful. Coming to the court without having sound evidence to support your claim and to gain an upper hand during the proceedings would be devastating for the landlord. Insufficient evidence may even dampen your chances of getting the tenant evicted through legal means while the tenant should rightfully be evicted. Courts may allow the tenant to occupy the property on grounds of lack of evidence. It is also possible that eviction process drags for three to four months. Therefore, if you want the process to be completed in due time and to avoid starting the eviction process again, it is important to provide evidence of your claims. It is essential to know the law and your legal responsibilities as a landlord to avoid the most common eviction mistakes landlords make.